A bowl of water sprinkled with pepper flakes sits ready on Mahesh Bandi’s kitchen countertop. Bandi, a professor of physics at the Okinawa Institute of Science and Technology Graduate University (OIST), wets the tip of a chopstick with liquid soap, amusement written on his face, and asks his dinner guests their predictions: what will the flakes do when the soap meets the water’s surface? He touches the chopstick to the water—suddenly, the flakes flee from the center of the bowl. This is but a very simple example of the Marangoni effect, which Bandi studies inside his lab at OIST’s Collective Interactions Unit. Reported as early as 1686, the phenomenon results from a difference in surface tension—the quality that causes a liquid surface to behave as though it were a stretched elastic membrane. The substance with higher surface tension pulls more strongly than the one with lower surface tension, pulling the flow of liquid toward it. James Thomson, the elder brother of physicist Lord Kelvin, described the phenomenon in 1855 as “the curious motions commonly observed in the film of wine adhering to the inside of a wine glass.” The very same force allows water striders to glide along the surface of a pond, and, as Bandi demonstrates, causes flakes to move across water. Yet, despite its ubiquity, the Marangoni effect is elusive. “You can see it in your kitchen, but it is notoriously difficult to quantify,” said Bandi. In a new study published in the journal Physical Review Letters, he and his colleagues present a method for doing just this by studying the phenomenon through three different independent measurements. Liquid soap does several things when it touches a bowl of water: some of it spreads over the water’s surface, while some begins dissolving in the water. The researchers found that these factors—which together constitute the Marangoni effect—can occur to varying degrees. Bandi and his colleagues worked from a mathematical model developed by Brown University professor, Shreyas Mandre, which predicts how a liquid like water interacts with a surfactant—a liquid like soap or detergent, which have lower surface tension, introduced at its surface. Using a custom-built clean room, scientists at OIST performed several experiments to confirm predictions of how the liquids would interact. 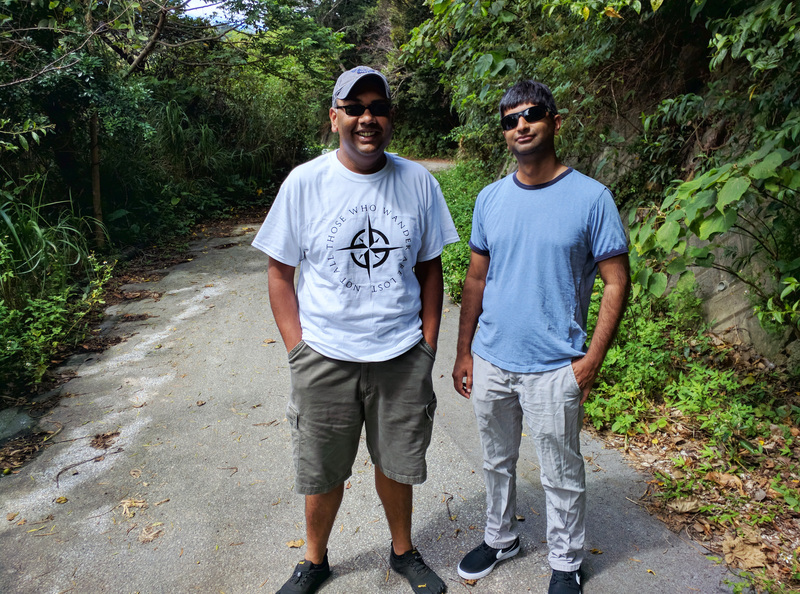 Researchers Mahesh Bandi (OIST) and Shreyas Mandre (Brown University) go for a walk in Okinawa. To show the movement of liquid, the researchers used a rectangular container filled with water. Next, they used a syringe to deposit surfactant, also containing tiny particles, at the air-water-interface—the exact surface of the water. The researchers then visualized the velocity of the two liquids using a technique called Laser Doppler Velocimetry, which detects changes in the frequency of light waves when a laser beam hits them. They verified their results with two additional methods. The scientists measured the surfactant’s spread down through the boundary layer and into the underlying water. They also measured the “shear stress” or intensity with which the surfactant drags the water. The researchers found that using their model, they could closely predict the speed at which a surfactant spread. Their findings fit within one of two scenarios: depending on whether or not the surfactant readily dissolved, it diffused into the water more or less quickly than it spread across the water’s surface. Previous work had suggested that a surfactant dissolves into water faster than it spread across the surface, but the new study demonstrates a more complex picture of how the dissolution and spreading of the surfactant affect the phenomenon. Researchers found that this measure depended on whether or not the surfactant readily dissolved. If so, it diffused into the water more quickly than it spread across its surface, and if not, it diffused less quickly than it spread. The study takes another step toward understanding a complex and dynamic phenomenon. A still frame from a video captured by researchers, this greenlit image shows the distribution of particles in water and a surfactant at its surface.